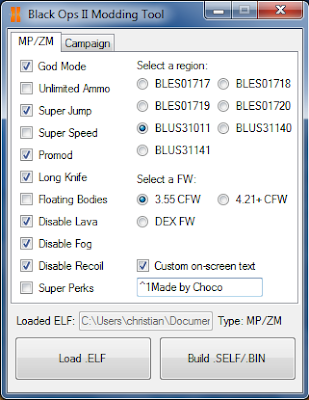 Today developer Choco from NGU has released a new PC tool to modify Black Ops 2 t6mp_ps3.elf to allow you to get access to cheats like God Mode, Unlimited Ammo, and Super Perks. Check out the changelog and the download link below. Make sure you have update 1.04 installed on your PS3 first! 2. Launch "BOII Modding Tool.exe". 3. 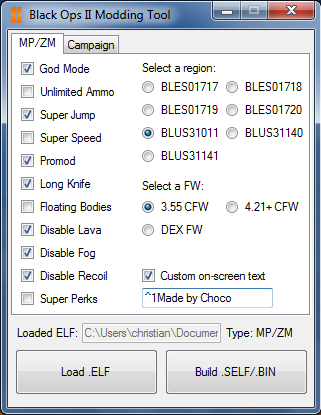 Load an ELF file for either campaign or MP/Zombies (EBOOT.ELF is for campaign, t6mp_ps3.elf is for MP/Zombies. Downloads for clean ELFs can be found in the downloads section of this post). 4. Check off whatever mods you want. Make sure to pick a region and a firmware version. If you want to choose DEX firmware, you will need to get the file "make_fself_npdrm.exe" from the PS3 SDK and add it to the folder with my tool. 5. Click on "Build .SELF/.BIN". Save the file as whatever you want. 6. If your mods are for campaign, rename the file you saved to EBOOT.BIN and copy it to /dev_hdd0/game/YOUR REGION/USRDIR/ on your PS3. 7. If your mods are for Multiplayer/Zombies, rename the file you saved to t6mp_ps3f.self and copy it to /dev_hdd0/game/YOUR REGION/USRDIR/ on your PS3. -I cannot provide a link to make_fself_npdrm due to legality issues. If you want to build your mods for DEX, you will need to get this file (can be found in the PS3 SDK) and add it to the folder with my tool in it. -Any false virus positives on my tool are due to protection of the application to prevent reverse engineering. -This tool will only work for ELFs from the 1.04 update. -If you use super jump in Campaign, you MUST use god mode to prevent dying from fall damage. -If you use Floating Bodies in campaign, some vehicles will float into the sky. This makes several missions impossible to complete. -YOU WILL GET BANNED IF YOU USE THIS ONLINE. Enjoy everyone! And please, DO NOT RELEASE ANYTHING MADE WITH THIS TOOL!